Last Sunday, Mommy Jane brought Little Angels to De Centrum Mall which located at Kajang to joined their grand opening and to witness the signing ceremony on their three-star hotel in 2020 in De Centrum City, Kajang to cater to the growing segment of business travellers in the area and families visiting students of the nearby universities. Development Sdn Bhd and its wholly-owned subsidiary, De Centrum Retail Sdn Bhd will refurbish an existing 9 storey student hostel building at an expected cost of more than RM30 million and the constructions works are expected to commence in 2018. Dato' Sri Ir Chong Ket Pen, Protasco's Group Managing Director and Executive Vice Chairman said that the Park Inn by Radisson will have a prime location within the growing population exceeding 36,000 in De Centrum City and the surrounding areas of Kajang, Bandar Baru Bangi and Putrajaya. With the Letter of Intent signed with Carlson Hotel Asia Pacific Investments Pte Ltd, it will be the first step in the partnership and a prelude to a hotel development services agreement and hotel management agreement to be signed later. Carlson Hotel Inc (Asia Pacific) was represented by its Executive Vice President of Development, Andreas Flaigh while Senior Director of Development, Marc Kramer represented Carlson Hotels Inc.
De Centrum Mall currently has 3 anchor tenants as well as an array of retail outlets carrying from IT stores, appliances and general household stores, fitness centre as well as a list of eateries of restaurants and cafes that spoilt visitors for choices. Fast-food chain, KFC and Pizza Hut and grocery store like Super Seven Cash & Carry grocery store and 7-Eleven can be found at the Mall. Do check out the SPP Bookstore that provides families with text books and stationery supplies our children needed for school. 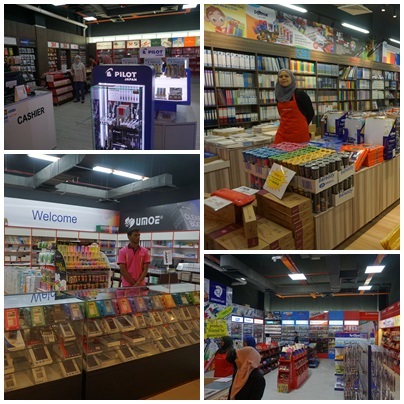 This Bookstore is the largest Bookstore that I ever seen in Malaysia. Protasco's property arm, Protasco Development Sdn Bhd also showcased their other development projects i.e. Blocks C and D of De Centrum Unipark Condominiums. It also showcase their another 2 projects at the Sentrio Business Centre, a new commercial development in Pasir Gudang Johor and D'Perdana, a new condominium project in Telipot, Kelantan. For more information and details, do visit their website at www.decentrummall.com.my and like their facebook page at www.facebook.com/decentrumMall for the latest promotions. Mommy Jane and Little Angels love to shop at De Centrum Mall. The bookstore was big and we could get lots of books and stationery at a discounted price. We enjoyed watching the performance of the lion dance and the Dinosaur Wildpark Live Show. Talented children who won the colouring contest received a big trophy and goodies from the bookstore. De Centrum Mall is indeed a family friendly oriented mall at Kajang which all of you should pay a visit. Afizah, best kan shopping kat sini. This is my first time here. Memang best for the opening. My children loves it too. Fieza, mesti suka. It is indeed a family friendly mall. Alia, come to KL, do visit this mall. U will impress with the design. Nampak meriah event pembukaan mall tu. Best! Aneezah, memang meriah. Great event for the whole family to enjoy. Hanis, they really love it especially can see lion dance and dinosaur live. De Centrum Mall is in Kajang and near to Bandar Baru Bangi, a food space with high potential of ROI for those purchase the SOHO Unit. Near to UNITEN and KLIUC. But a, thanks. Easier to find them later. Ha ha ha... Indeed a great investment with lots of potential.